A full day walk in this magnificent glacier. The day was unstable cloudy some times, then harsh light other times. So, it was a day to shot different images with different light. 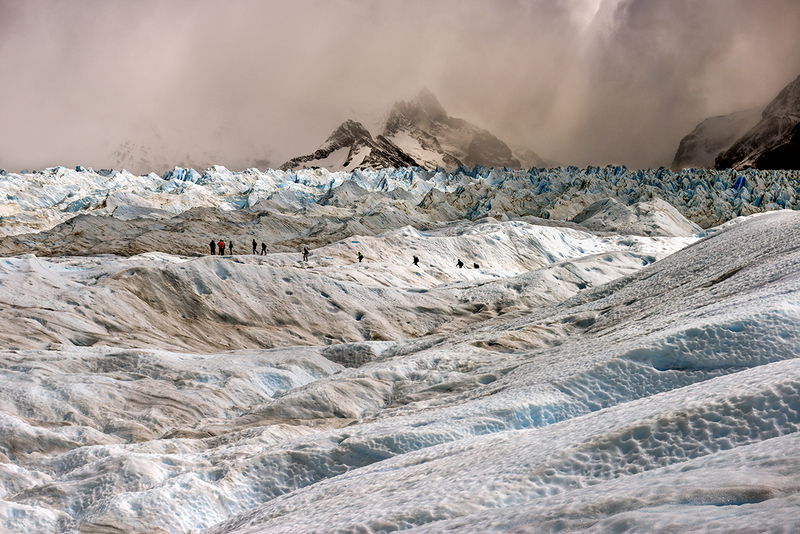 Perito Moreno is considered to be a “stable” glacier in the sense that it is neither advancing nor retreating. It is famous for the way it periodically pushes right across the channel, forming a massive dyke of ice that cut off the Brazo Rico and Brazo Sur from the main body of Lago Argentino. Isolated from their natural outlet, the water in the brazos (arms) would build up against the flank of the glacier, flooding the surrounding area, until eventually the pressure forced open a passage into the canal once again. The immense pack ice of the GLACIAR PERITO MORENO (also called Ventisquero Perito Moreno) is one of Argentina’s greatest natural wonders. It’s not the longest of Argentina’s glaciers – nearby Glaciar Upsala is twice as long (60km) – and whereas the ice cliffs at its snout tower up to 60m high, the face of Glaciar Spegazzini can reach heights double that. However, such comparisons prove irrelevant when you stand on the boardwalks that face this monster. Perito Moreno has a star quality that none of the others rivals.